The sole winning ticket for a $110 million Powerball jackpot was sold at South Los Angeles' Choice Market, officials said Aug. 2, 2015. 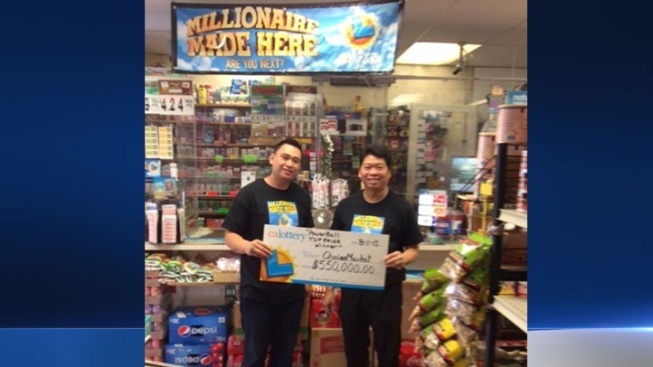 The owners of the store, Far Yi Hun and Larry Hun, will receive $550,000 as a retailer bonus. Someone who bought a Powerball lottery ticket in South Los Angeles this weekend woke up $110 million richer Sunday morning. The winning ticket for Saturday’s drawing was purchased at Choice Market at 5001 South Western Avenue, and was the only one in the country to match all five numbers and the Powerball number. The winning numbers were 13, 7, 49, 24, 57 and the Powerball number was 15. The owners of the market that sold the jackpot-winning ticket will receive a bonus of $550,000 for their role in the sale. The winner has not yet come forward, and lottery officials urged the person to sign the ticket and keep it in a safe place until it can be taken to a lottery district office.